After using razors, some people break out, where the skin on the face or legs becomes irritated after shaving. In most cases, the friction of the razor on your skin is causing the breakout. 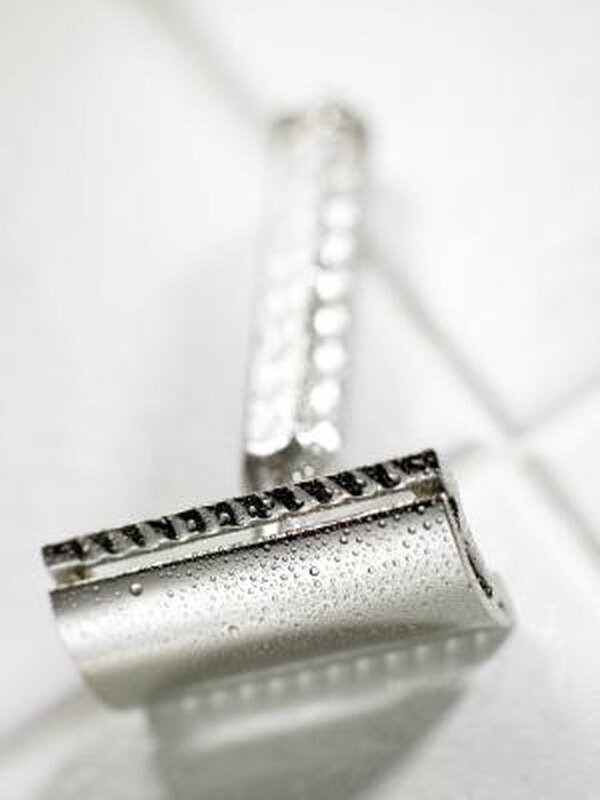 A few razor users might be allergic to the coating of nickel that can be found on the surface of most razors. An allergy to nickel is not uncommon. According to Nature.com, between 5 and 10 percent of men living in industrialized nations are allergic to nickel and between 10 and 20 percent of women are allergic. You can develop an allergy to nickel at any time in your life and the allergy might last for a few years or for the rest of your life, depending on your immune response, according to the New Zealand Dermatological Society. Nickel is used in a wide range of items you come in contact with every day, according to the Nickel Institute. It ranks as the fifth most frequently occurring element on earth. Because it resists high heat and corrosion, it's used to coat metal jewelry, pots and pans, water faucets, watches, batteries and many other metal objects that need protection from heat and water, including razors. Razor blades and shaving foils in electric shavers contain small amounts of nickel, according to the Nickel Institute. If you're allergic to nickel and you come in contact with it, your skin could become very itchy, according go the New Zealand Dermatological Society. Your skin may develop redness or even blisters. Either that or your skin might become dry, thickened and pigmented if you develop chronic dermatitis from contact with nickel. To find out for sure if you have a nickel allergy, Columbia University recommends seeing a dermatologist to conduct a patch test. Easily test your razor to find out if it contains any nickel. Get get a dimethylglyoxime spot test from a dermatologist or drug store. The test has two bottles of liquid that you mix together. Afterward, place the liquid on the razor. If it turns pink, the razor contains nickel. If you're allergic to nickel and your razor contains nickel, switch to a razor that does not contain nickel. According to a 1997 case report on razor-nickel allergies, one patient who had a nickel allergy from his razor quickly improved when he simply stopped using the shaver. A doctor may prescribe steroids or ointments to treat an allergic outbreak form nickel contact. Your sensitivity to nickel is likely to remain permanent so avoiding the metal, and razors that contain the metal, is the best long-term option for avoiding allergic reactions. Nickel Institute: Did You Know?